IMPORTANT: RV Indochine cruises must be reserved over the phone. Call us for more information. RV Indochine is a beautifully handcrafted ship specifically designed to navigate even the most remote areas of the Mekong River. Built in 2008, RV Indochine accommodates 60 guests and offers a river view from every stateroom with large windows and personal deck space, and an extraordinarily friendly atmosphere with attentive, English-speaking crew. Explore the sights, sounds and flavors of one of the most culturally diverse regions in the world while enjoying the comfort and elegant romance of the RV Indochine. Keeping line with CroisiEurope's standards, you will receive the very best of seRVice aboard RV Indochine. The fact that CroisiEurope specializes in river cruises means that the experience of a river cruise will not be matched by any other company. From panoramic windows to the most expert of river tour guides, there will be no shortage of enjoyment aboard RV Indochine. RV Indochine's immersion in local culture does not end with the river. Open dining is provided throughout the day so guests can partake in the finest in local cuisine at any time of the day. Expertly trained chefs use the freshest ingredients to prepare regional delicacies which match perfectly with hand-picked bottles of local wines. Off-boat activities are also offered to compliment the on-ship portion of your voyage. Try your hands at local activities and custoMS to get the real-world feel of the area you are traveling in. From music to food and wine tastings, you will have many tales to bring back to your friends and family. RV Indochine's chefs create a variety of tasty offerings for you, with freshly prepared seasonal local vegetables, local specialties adapted to satisfy the tastes of our passengers, and homemade soups prepared daily. For breakfast, choose from a selections of pastries, cereals, breakfast meats, egg dishes, fresh fruit and selected cheeses. At lunch, select from the soup and sandwich bar, or a choice of entrees and dessert. And for dinner, you are treated to a full menu with regional specialties. Huge Discounts & Low Price Guarantee on all RV Indochine Cruises! 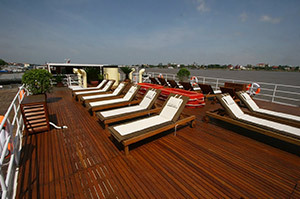 Book any RV Indochine cruise with us and you'll get the best deal possible, regardless of the ship or sail date! 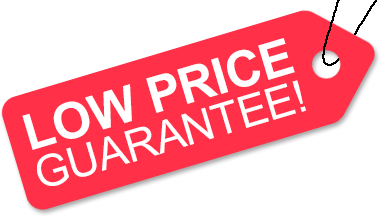 Because of our huge price discounts and "Low Price Guarantee," nobody beats our RV Indochine cruise prices, so look around and you're sure to find the best RV Indochine cruise deal possible when booking with us! We do not charge booking fees on any cruises! You're sure to enjoy an affordable RV Indochine cruise when booking with us! 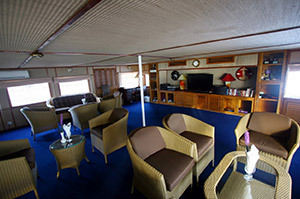 Our special offers on RV Indochine cruises may not be combinable. Certain restrictions apply to each offer. View terms and conditions during the online booking process. Staterooms have comfortable yacht-style berths Beautiful brass and teak furnishings Under-bed storage drawers plus wardrobe for hanging garments Upper Deck location with view and outdoor promenade seating Private bathroom with shower Air conditioning with individual climate control In-room safe. 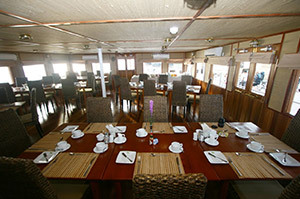 The deck plans of RV Indochine provided on this page are subject to change. We reseRVe the right to correct errors. Please verify all information with CroisiEurope directly. For photos of staterooms, please click the accommodations tab provided above. Photos below are artist's rendering of RV Indochine. Ship is subject to modifications.